We are all about easy and healthy snacks in the farmhouse, yogurt and granola being a staple. 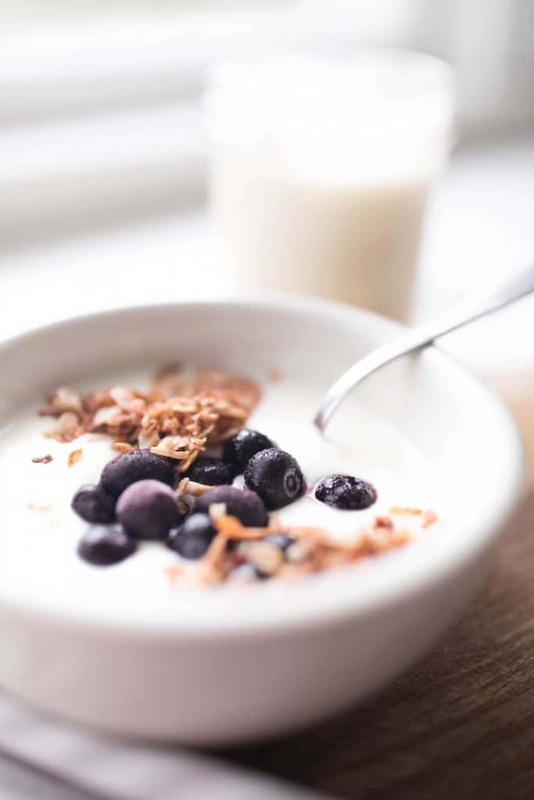 Learn how to make yogurt in the Instant Pot, to enjoy this awesome snack on the cheap. Yogurt making has been more of a saga over the last ten years, than something I could say I confidently mastered five years ago. First, I tried the crock pot method. It went something like this. Get the milk super hot in the crock pot. Then, after it cools back down, wrap it up in five towels to trap the heat in. Ask me how many milk soaked towels it took for me to quit that method. Next, I tried something similar with heating pads and a cooler. My results were inconsistent at best. When my family went on the GAPs diet, a gut healing protocol, in 2016, I learned about 24 hour yogurt. 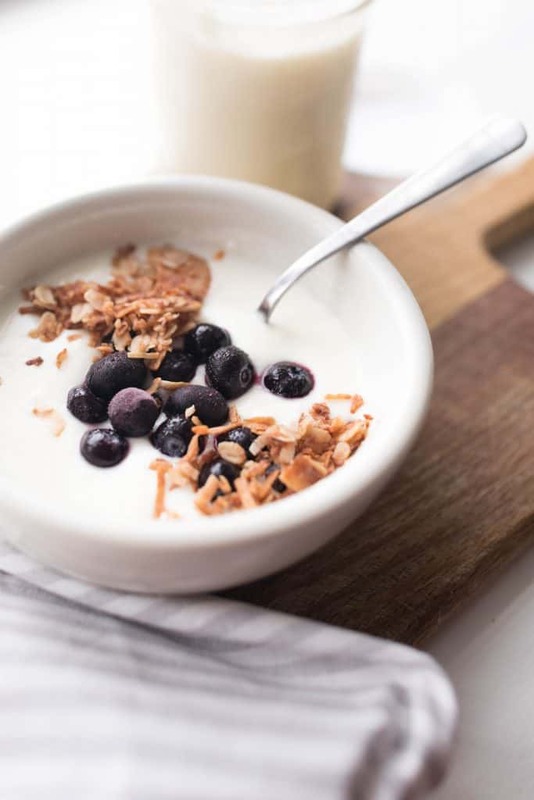 The premise behind this is that the gut can’t easily digest lactose, but when yogurt is fermented for at least 24 hours, the good bacteria consume all the lactose. I might be reporting the science a little wrong, but its definitely somewhere in the neighborhood of right. Basically, yogurt that has been fermented for 24 hours is suitable for a gut healing protocol. Now, do you think my crock pot or cooler method can keep milk at a constant temperature for 24 hours? Not a chance. Because of this, we stopped consuming yogurt and dairy products, while we were on the GAPS protocol, all together. November 2016, I finally tried out the Instant Pot everyone was talking about. And boy oh boy, my yogurt dreams came true! I have tried raw milk yogurt, and regular yogurt that is comparable to store bought. I’ve fermented it anywhere from 8 hours up to 24. All with great success! Pour a half gallon of milk into the Instant Pot, and press the “sauté” button. Whisking constantly, allow the milk to rise to 180 degrees. I use a small pocket thermometer to test the temp. Press “cancel” to turn it off. Allow the milk to cool back down to 115 degrees. Whisk in 1/4 cup of plain yogurt. You can either use store bought, or start with a starter culture. I started with these cultures, and now I make the next batch with a little yogurt from a previous batch. I like to not get too far removed from the original starter. So, after four of five rounds of using the yogurt from a previous batch, I will go back to another starter packet. Milk is heated to destroy bacteria that are present in milk, and could compete with the yogurt cultures, Lactobacillus bulgaricus and Streptococcus thermophilus. Heating changes the structure of the proteins in milk that gel, causing the finished yogurt to have a thick consistency. You don’t have to heat the milk, but if you want to eat the finished yogurt with a bowl and spoon, you might want to. There is a way to make raw milk yogurt with the help of gelatin and some different cultures. I have had great success with this method from Traditional Cooking School. As far as fermenting time goes, for bowls of yogurt I like to do the 8 hour ferment. Any longer and my kids say its too sour. For smoothies, they can tolerate the 24 yogurt. I sweeten it up by blending it with frozen bananas and strawberries. When my yogurt is all done, I store it in a half gallon mason jar with a plastic lid. It will keep for two weeks. These are affiliate links, which means I make a small commission at no extra cost to you. See my full disclosure HERE. Who knew you could do this? 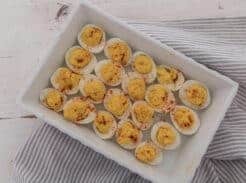 Wow, it looks so easy and so good! This makes me want to add an instapot to my kitchen! 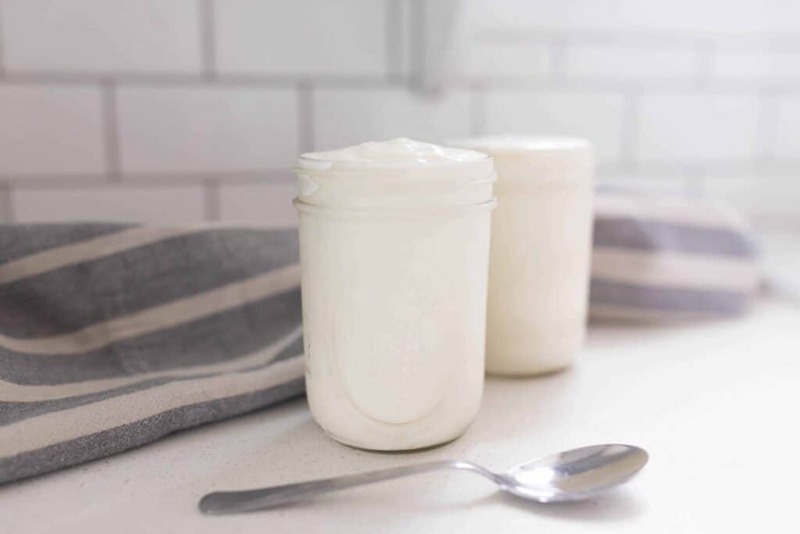 How do you make yogurt in an Insta Pot without the yogurt setting ? Unfortunately you will need one with the yogurt setting. Can you please answer a question for me, I was wanting to know when you make the oatmeal using 2 cups of oats add the milk and stir then cover. My question is I will be using 2% milk and will it be alright leaving it out all night? I’m worried about spoiling …. please respond …. Thank you for doing your blog I throughly enjoy it…. Hey Becky! Since you are using store milk, maybe just use water instead of the milk. It should be ok, but I’m not 100% sure with pasteurized milk. You could also use coconut milk. 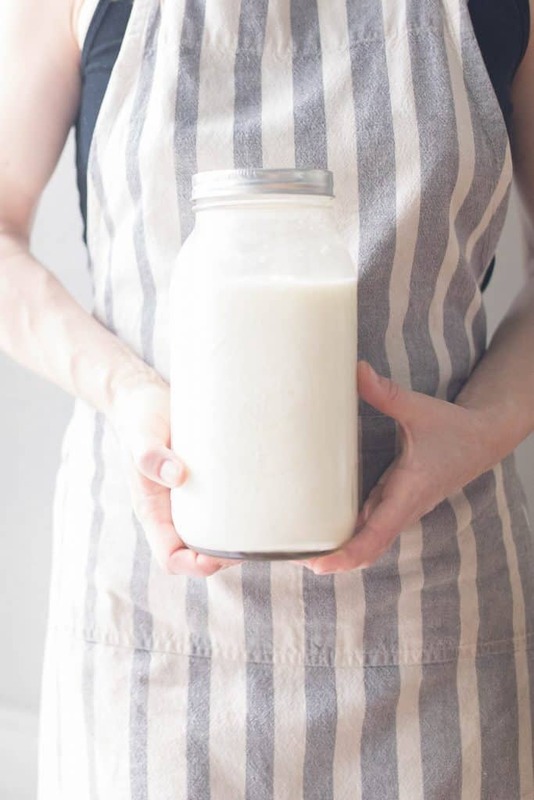 For the oatmeal recipe, you can use coconut milk or water, if you don’t have organic raw milk. 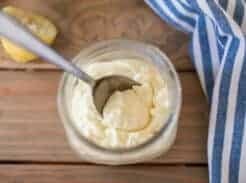 I’ve been following you for a while now and just got up the courage to make this instant pot yogurt. It turned out so much better than I thought it would after fermenting for 10hrs. My question is, how do you thicken up the yogurt? Mine was still a bit runny and not the normal store bought yogurt consistency. 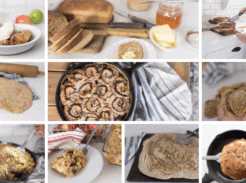 Or is runny the normal for homemade? I’m allergic to milk. Do you know of a good recipe to make coconut yogurt? Culture’s for Health has one, and they have a dairy-free vegan starter as well! When ferment for 24 does the yogurt smell sour, like spoiled milk? It smells sour, but not like spoiled milk. The cultures keep it from going sour in that way. Just heats milk to 180 degrees…after it’s done cancel the warm setting to off. Let it cool to about 99 deg. After cooled take milk yogurt and mix with 4-5 oz of plain store bought yogurt and beat together instead small bowl. Then add back into pot and then time it for 8 hours, once done take inside pot to fridge. Does it matter if using organic milk or can I use any kind of milk….trying to be cost effective. I’m scared to make it how do I know if bad…..I don’t want to poison my kiddos! Hi Lisa just wondering have you ever tried to make Greek Yogurt? I am also curious as to why you picked the Medium Flavor “Traditional” Yogurt & not another kind? Was it for health reasons or are you just not a huge fan of Greek Style Yogurt….please let me know I start my yogurt journey next week when I receive my instant pot.